The term growing on substrate is often used incorrectly. A substrate is synonymous with everything that a plant can grow in or on. The substrate, or growing medium, serves to keep the plant in place as well as provide an environment the root system can function in. 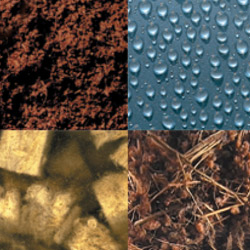 Examples of substrate are potting soils, coco and rock wool. There are basically two methods of cultivating with substrate; run-to-waste and recirculation. In a run-to-waste cultivation system the feed water passes the roots just once and is then disposed. This is in contrast to re-circulating systems, where the drainage water is reused. In run-to-waste systems we make a distinction between substrate that interact with the plant and substrate that don’t. Interacting substrate, such as potting soils, composts or coco, retain nutrients themselves, which influence the extent to which you need to further feed the plant. This holds true with coco’s feeding and nutrient retention properties even though they also differ from typically CEC (Cation Exchange Capacity) mediums. CANNA has developed 4 ranges: CANNA Terra is for cultivating in potting soils and soilless mixes. CANNA COCO for cultivation on coco. CANNA AQUA is for use on inert mediums that the nutrient solution is passed through then returned to the holding tank. AQUA is designed for long term availability in this environment. CANNA SUBSTRA is for substrate that retain or release almost no substances: the so-called inert substrate. SUBSTRA is designed so that the nutrients are available immediately. If you choose to cultivate in a run-to-waste system in combination with an inert substrates, you are choosing a growing method that almost guarantees high yields. However, this is certainly not the easiest growing method, and you will only be able to achieve high yields with the same professional approach that allows for all the variables in growing including temperature, humidity and so on. The advantage of this growing method is that you know the exact composition of the feed water and so you know exactly what your plants are being fed. The big disadvantage of this method is that the drainage water goes directly into the natural surroundings, so it is very important that the feed you choose is specially designed for this growing method. Only then can you be sure that the minimum possible residue materials will enter the environment while the most is going into the plant. CANNA SUBSTRA has been specially designed for this method of growing. The advantages of hydro cultivation include being able to accurately manage the nutrients, the amount of water given and the pH. There are many more advantages. You will hardly experience any problems with soil-related diseases or weeds; the substrate used for hydro cultivation are weed and disease free and are often referred to as sterile. Additionally, measuring the pH and the electrical conductivity (EC) in the growing medium is simple. The electrical conductivity gives an estimate of the total amount of dissolved salts and tells you something about the amount of feed given. A disadvantage of hydro cultivation is that the substrate used is not always reusable or recyclable. Other disadvantages include the higher initial costs for the substrate themselves, the equipment required, increased required monitoring, and faster response to deficiencies in nutrients. Rock wool was discovered in 1840. Nowadays it is manufactured in factories. The volcanic rock is ground and pulverised to grit. This grit is then heated up to 2735 °F, at which temperature it melts. This viscous substance is then poured onto a rapidly rotating sheet. This forms droplets and each droplet is stretched into a long fibre. These fibres are cured in a kiln and then consolidated into slabs of rock wool. Any shape finished product can then be cut to size. In this process 1 m3 of raw material becomes no less than 90 m3 rock wool. Besides the applications for thermal, fire and sound insulation, in the early 1970s it was discovered that rock wool could also be used as a good growing medium for plants. The rock wool used in construction for thermal and sound insulation is not suitable for cultivating plants. This is because mineral oil is added to make the material water-repellent. A rock wool variant has been specially developed for horticulture. It has considerable capillary capacity, This type of rock wool can retain up to 80% water and still contain 15% air. The remaining 5% is the rock wool itself. Because each crop has different requirements, different types of rock wool have been developed. The main differences are in the structure of the fibres, horizontal or vertical, their thickness and density. Rock wool is available in various shapes and sizes; for example small plugs or cubes, for germination and propagation, in which seeds or cuttings can take root. These cubes fit into blocks where the young plants can continue to grow. There are also slabs in all imaginable dimensions. These are also known as slabs on which you can place the blocks with young plants. Many plants don’t like having “wet feet”. A rock wool slab that is too soft will retain too much water, and one that is too hard will provide too much resistance to the growing roots. A hard slab means that the plant spends a great deal of its energy developing roots – energy that the plant can better use for growing above ground. Therefore the ideal rock wool slab is not too hard and has a horizontal structure so that there is ample volume available for root growth. The quality of a plant is largely determined under the ground, in fact 50%, so the bigger the root volume, the healthier the plant and the higher the yield. One aspect of growing that is often forgotten is the waste feed water that drains into the sewage system or, worse, into the ground water. The drainage water from CANNA SUBSTRA nutrients does not contain any serious pollutants, so the burden on the environment is minimal. Another significant difference between CANNA SUBSTRA nutrients and other products for run-to-waste cultivation is the raw materials used. Because CANNA carefully selects the purest possible raw materials for its products there are considerably fewer heavy metal particles in the drainage water. CANNA SUBSTRA also contains no ‘Red Iron’, oxides of iron such as ferrous oxide. The notion that ‘red iron’ is more easily absorbed by plants is only valid at higher pH values; the pH range maintained in run-to-waste cultivation systems is too low. Large quantities of ‘red iron’ are added to many products to ensure that there is sufficient iron for the plant to absorb, but much of this iron is not taken up by the plant. So instead of ‘red iron’, CANNA uses a special yellow variant in its SUBSTRA products. This ‘yellow iron’ variant is absorbed well by the plant at the pH in the root environment; so considerably less yellow iron is needed than of the widely-used ‘red iron’. The idea that run-to-waste systems are more harmful to the environment than recirculation systems is therefore not entirely correct. There is waste water in both systems; a constant trickle in run-to-waste systems and in recirculation systems a relatively large amount from time to time. The amount of waste water depends on the watering system and the dryness of the substrate, a dry substrate requires more feed water than a wet substrate, and thus not on the type of cultivation system.